There are 87 resorts in Maldives catering to different budgets and tastes. The Banyan Tree Maldives Vabbinfaru in the North Male Atoll, a short boat ride from Male, is a scene of serenity and charm. Conical thatched roof huts are set along a secluded beach and surrounding azure sea. When the shutter doors are flung open, the spacious villas allow the balmy sea breezes to fill the room, while you get a spectacular view from the old world four poster beds. Delight in the mesmerising feeling that you are sleeping literally on the beach or floating at sea. Also at North Male Atoll is the recently refurbished, Four Seasons Resort at Kuda Huraa. The resort's design concept integrates nature, ethnicity and luxury. Exotic native fabrics and artwork line the property next to marine motifs like seashell carvings and fish etchings. The beach and water bungalows have a spacious outdoor feel with outside courtyard sowers and gardens filled with tropical foliage. 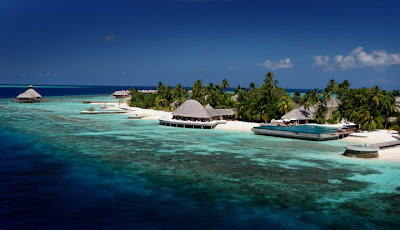 At the edge of Ari Atoll, West of the Male Atoll, is Rengali and Rengali Finolhu islands, home to the Maldives Hilton where there is a bridge linking the two islands. 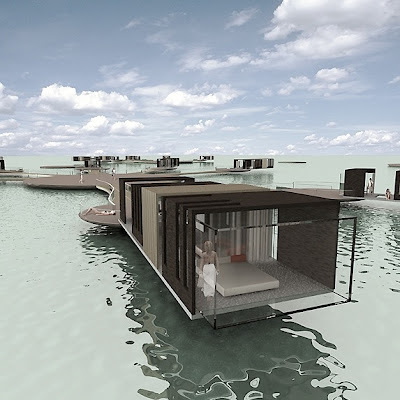 All its 100 beach villas face the sea and there are 28 water villas standing on stilts in the lagoon. Richly decorated in timber, oak, teak and cedar, the resort has a luxurious feel throughout. Open air bathrooms lie steps away from the sand and sea. Guests can indulge in their specially created meals that can be served as a barbecue on the terrace or as a picnic on a deserted island while staff will discreetly leave you alone. 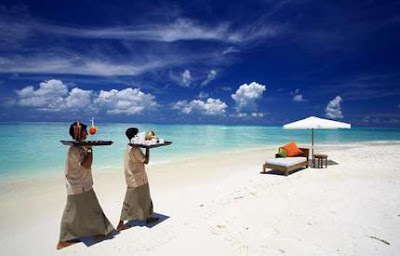 Lying slightly off the beaten track is the Kanuhura Beach and Spa Resort. Located in the Lhaviyani Atoll, it is only accessible by sea plane. For those seeking the definitive spa treatment, the resort boasts thelargest state of-the-art health and beauty spa facilities. Accommodation comes in the form of 97 deluxe villas decorated in local flavours. Its Havana Club is the perfect setting to partake in quality wines, aged liqueurs and fine cigars accompanied by mellow piano music under a canopy of stars. The resort prides itself in practising responsible eco-tourism by using natural materials and solar energy. Environmental awareness is evident in the design setting, operations and management of the resort. A research laboratory is being planned to focus on conservation and regeneration of the island's flora, fauna and marine life. To enjoy the harmonious and luxurious life bathed by sun and the sea; for fine dining, style, privacy and rustic wilderness, the banyan Tree Maldives Vabbinfaru is hard to beat. Meals are intimate affairs held under the swaying palms and the twinkling gaze of the stars. There are luxurious spa treatments to be indulged in to ease away aches and pains. The six-pavilion spa is a haven of relaxation and beauty and even has a school of "resident" stingrays that come into the shallow waters at sunset. Maldives is a celebration of the wonders of our natural world and the perfect antidote to stressful realities of this world where the essence of pleasure is an art. This is certainly the place to pamper yourself and recharge drained batteries. It is not surprising therefore, that its allure is timeless. 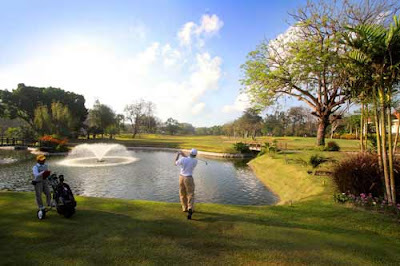 Bali has long been known as one of Asia's top golfing destinations. With professional courses, designed by some of the world's top golfing names, set in areas of outstanding natural beauty, the island has been attracting enthusiasts from around the world for many years. However, apart from the three well-known major 18-hole courses of Nirwana Bali Golf Club, Bali Handara Kosaido Country Club and Bali Golf and Country Club, one course has remained very much a local secret until recently. However, following a multi-million dollar renovation, the nine-hole Bali Beach Golf COurse in Sanur has now joined the island's top courses in terms of facilities offering and golfing enjoyment. Located adjacent to the historical Bali Beach Hotel, this delightful 'inner city' course offers surprising amounts of green space, with rich vegetation, glorious old trees and well-maintained fairways providing not only good golf but exceedingly pleasant surrounds. The convenience of being so close to Sanur and the Kuta/Seminyak area means that it's very possible to play a quick round without spending time stuck in traffic traveling to and from the course, thus freeing up the rest of the day for other holiday pursuits. 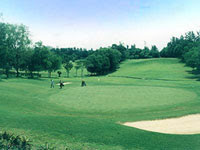 The 3560 yard, par 36 course is varied enough to appeal to golfers of all levels. Water features, hidden bunkers, sloping greens and often narrow fairways can prove tricky enough to keep even the expert golfer interested - there are seven par four holes, one par five at 546 yards and one par three at 164 yards. Here, a constant head wind makes things a little more difficult with a water hazard thrown in for good measure. The par four hole six is also a demanding challenge, with a lake causing all kinds of trouble for wayward shots and a difficult green well surrounded by bunkers. Short enough to walk around, the course is blessed with beautiful flora and golfers are rewarded with dramatically flowering flamboyant trees and old twisted banyins on the inspired landscape. Apart from a well-stocked pro shop and a tastefully renovated clubhouse, there is also the brand new Sector Bar and Restaurant, offering deserved refreshment and a good choice of local and international dishes. In the evening, the venue fills up when live music and visiting Djs transform the bar into one of the islan's more popular nightsports.